Unstoppable Power. Extreme Focus. Limitless Energy. Skin Ripping Pumps. For Men and Women. Listen, your time is everything and we know you want to get the most out of every workout. RedCon1 shattered the mold when they formulated this pre-workout. It is for the most dedicated of us – and that means you. If you’ve been looking for a reason to go even harder, you found it. If you’ve been looking for a product to take you to the next level, you found it. Welcome to your new training goals, because after RedCon1 Total War, your old goals will seem like a cheat day. Total War is what every pre workout wishes it was, packing more firepower per serving than anything in its class. The powerful combination of stimulants and focus factors along with nitric oxide compounds makes Total War an all-out brawl. Feel the most intense muscle pumps fueling your wrecking-ball workout. 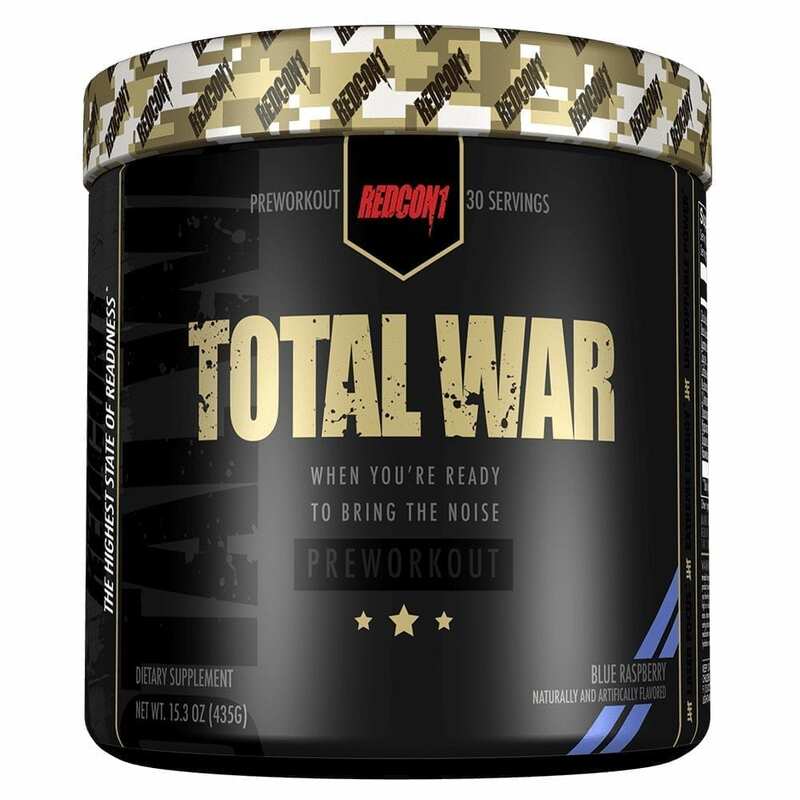 This pre-workout has every other pre-workout worried. 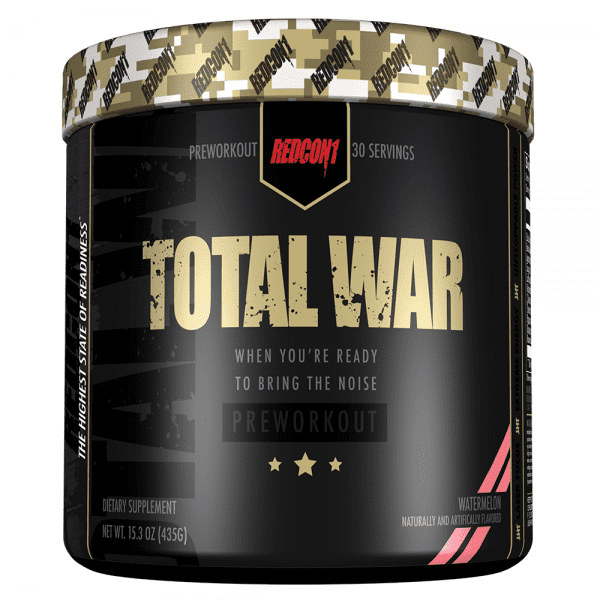 RedCon1 Total War is one of the highest rated pre-workout supplements our research has found. We could not pass up getting in on this Total War. 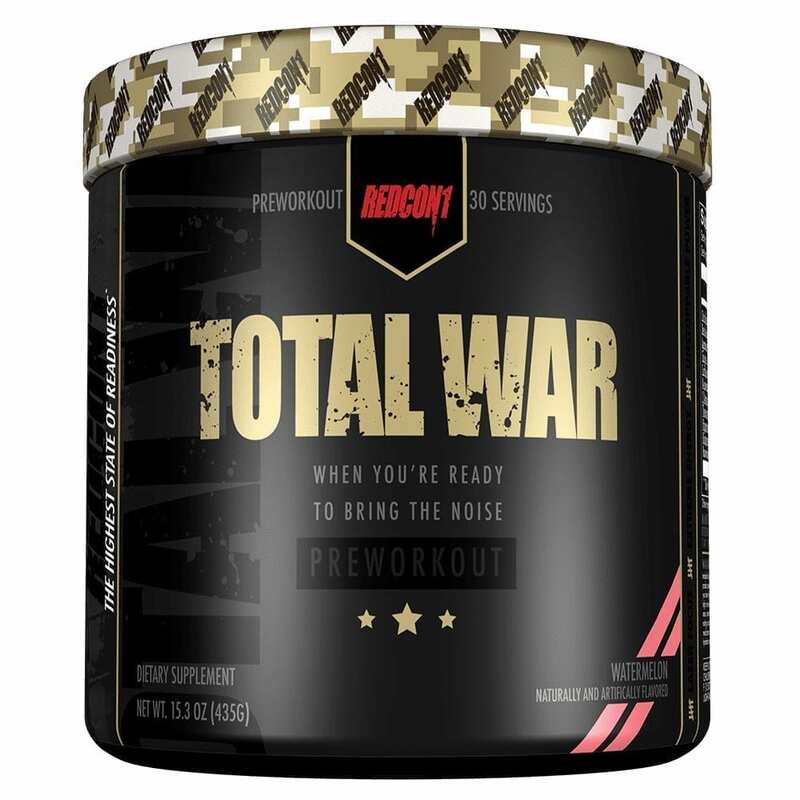 Pre-workout is synonymous with routine and results at this point, and RedCon1 Total War is easily the quintessential pre-workout on the market. You don’t “settle” in the gym, so don’t settle with a lesser product. Compounds found in both watermelons and apples, so you know you aren’t taking some man-made chemical. 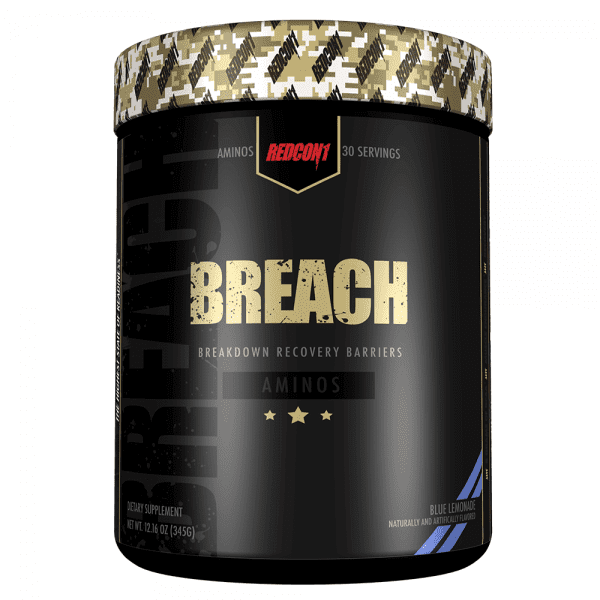 This dual-ingredient is often claimed to be the next big thing in performance enhancement – even rivaling Creatine. 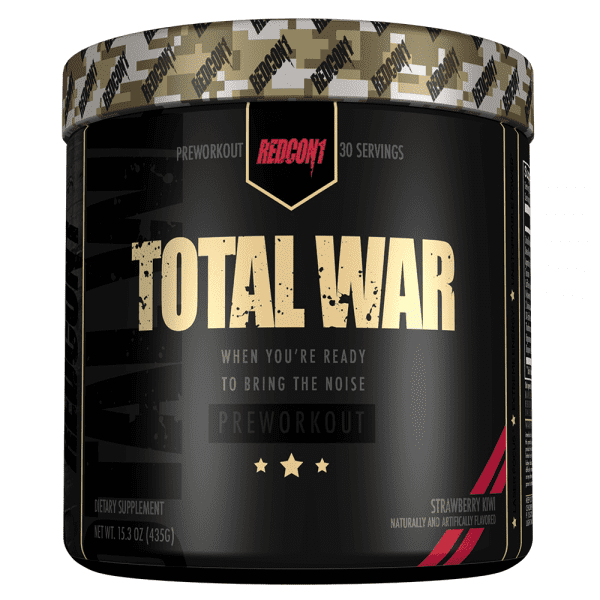 Its role in regulating Nitric Oxide (NO) puts you in the trenches for the long haul and it does the job very well. So we’re talking about increased blood flow, oxygen delivery, glucose uptake, muscle firepower, and muscle growth. Power. Performance. The building block of carnosine, a molecule that helps buffer acid in muscles, increasing physical performance. Helps foster lean muscle gain. Antioxidant. Anti-aging. * Jack of all trades. Alleviates neuropathic pain and drug addiction. Protects from strokes and benefits cognitive health. A required building block of protein, Taurine was the feature of a study in the journal Amino Acids, finding that the anorexigenic action of taurine enhances the role of insulin in the control of food intake and helps stall body fat gain. More studies need to be run, as is usually the case – we can always know more. However, Taurine is really a promising ingredient with lots of potential. Good news for us. Known by the brand name Infinergy®, this ingredient is an ionic bonded combination of caffeine and malic acid and is trademarked by Creative Compounds LLC. Like other forms of caffeine, dicaffeine malate can increase focus, energy, and metabolism while decreasing perceived fatigue. This product is gaining steam because unlike caffeine anhydrous, dicaffeine malate offers a unique advantage in that the malic acid supposedly calms the digestive distress commonly caused by natural caffeine and caffeine anhydrous without losing all the beneficial effect of caffeine. The feel-good ingredient found in chocolate. Higenamine is a molecule derived from a variety of fruits and plants that appears to have anti-asthmatic properties via dilating the bronchial tubes (a mechanism known as Beta(2)adrenergic agonism). This mechanism is also the same one underlying the fat burning potential of ephedrine, and as such, Higenamine is currently being used as a fat burner. May also have anti-inflammatory properties. One of the biggest benefits of bioperine is that it increases the bio-availability of different useful products. Selenium is one of the essential nutrients for the human body. It was seen that after using bioperine, the amount of selenium increases two times the original amount which is present in the body. Selenium is used in different antioxidant reactions of the body. Selenium also plays a great role in thermoregulation. Metabolic processes that are essential for making energy for the human body at the cellular level are called thermogenesis. Thermogenesis is considered to be the most important factor in maintaining weight loss, further research revealed that thermogenesis plays a vital role in utilizing food and nutrients that are consumed by the human body. Although it won’t necessarily cause any harm, there wouldn’t be much point in taking a training supplement unless you plan on training. Can I eat before I take my pre-workout? While you can eat, RedCon1 recommends that you wait at least an hour after eating before taking the supplement. Eating can diminish results. Great question. Yes! 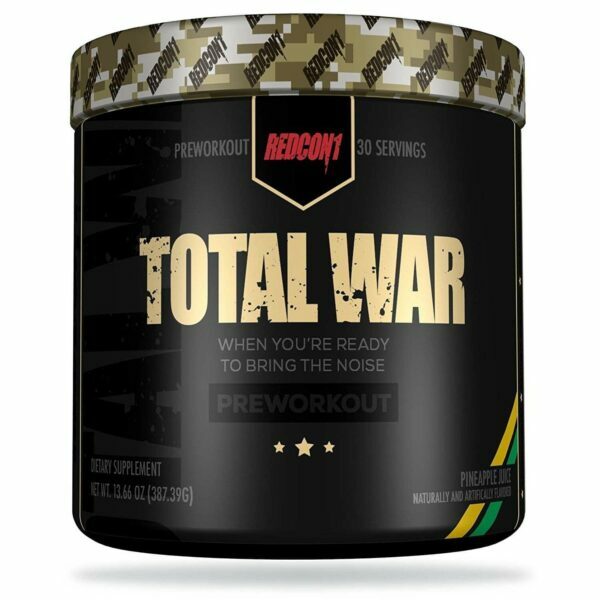 RedCon1 Total War will increase energy, motivation, and even increase metabolism. It won’t harm your goals and may even help you reach them. Absolutely. If you want to make sure the amount of caffeine you are consuming won’t keep you up, pay attention to the levels. You will reap all of the other benefits, despite how late you grind. Okay, you almost have me, what else can you tell me? At eXplicit Supplements, we like to let the ingredients speak for themselves: Of each 14.5g serve of RedCon1 Total War, 11.86g are devoted to active ingredients. This leaves an impressive 18.27% of each serve devoted to flavour and sweetening agents, considering it is common for alternate products to devote more than 50% of each serve to such! So you are truly getting bang for buck with RedCon1 Total War, exactly what you’re paying for.